Luxury for less than $200 a night is possible. Here's a look at the properties that go easy on your wallet while making you feel pampered. Editors' pick: Originally published Sept. 8. We all have our own vision and version of luxury, particularly when it comes to hotel accommodations. For some it's hotel staff catering to every whim; for others its opulent rooms, outstanding views and over-the-top spas. And for still others, it's as simple as free Wi-Fi and designer toiletries. Hotels.com recently released its list of the luxury hotels most loved by the site's 20 million users, and in many ways, the ranking reveals what luxury has come to mean for the masses. The properties that made the top ten were singled out for such things as having free Wi-Fi, a nice bar, intriguing design or free coffee, pastries and shoe shines. "It's really all about the details and finding the details that resonate with you," says luxury travel aficionado Anthony Berklich, who founded the site Inspired Citizen, which chronicles the planet's latest high-end offerings in travel, food and fashion. "Luxury is not a one size fits all thing." 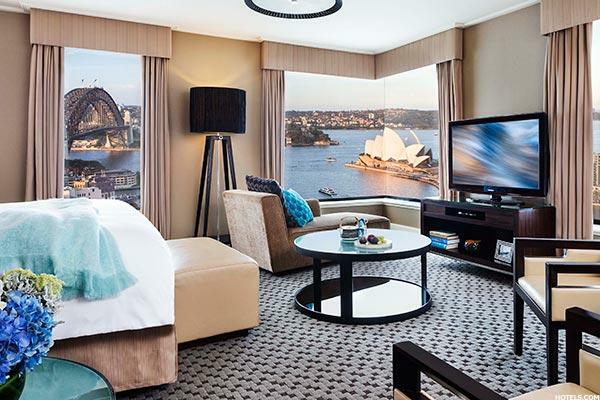 Nor is luxury always ultra expensive - at least according to the Hotels.com ranking, which reveals a decidedly affordable or middle-market take on luxury. Rooms at several of the properties on the list can be had for less then $200 per night. Some of the properties that made the top ten include Hotel Sofitel New York; the Dolce CampoReal Lisboa, in Lisbon, Portugal; the Mondrian London; and the W Taipei in Taiwan. "Affordable luxury is the term we have seen show up in a lot of the reviews," says Josh Belkin, Hotels.com general manager for North America. "If people shop smart, take advantage of promotions and loyalty programs, they can stay in luxury properties affordably." What's more, that affordable luxury Belkin is talking about is available at four to five star properties. If you're on the hunt for budget-friendly, luxurious accommodations, here's a closer look at the top ten hotels on the list (and the details guests raved about). A pool with a view -- that's the luxe takeaway for this property. 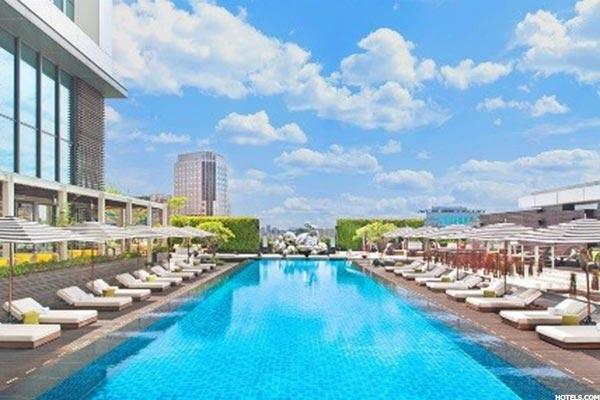 The W Taipei is known for its glitzy, sky-high outdoor pool, located on the hotel's tenth floor. In addition to sweeping views of the city while lounging, there's also larger-than-life stainless water drop sculptures to behold and a poolside beach. "It's quite a dramatic scene, if you can imagine," says Belkin. "The crazy architecture is not something you're likely to see at other hotels." Guests also give positive reviews to the hotel's overall vibe and its fantastic service. Four Seasons is among the legendary luxury brands, so it's not exactly shocking that one of their properties made the list. The details that put this property in the top ten include being located in a historic part of Sydney, near the beaches, and outstanding service. "You can rely on the Four Seasons standard of service, and that absolutely no matter where you go [in this chain of hotels], the staff will provide anything you ask and they tailor it to the location," says Berlklich. Location, location, location. It's a famous real estate mantra, one that also holds true when it comes to pleasing guests in the hotel industry. In the case of the Sofitel New York, the property's location just behind Times Square, is the number one thing guests rave about on the Hotels.com top luxury properties listing. But that alone does not make this a standout luxury property. "It's what's inside," explains Belkin. "The service there is excellent, it's an extremely clean hotel, and then there's the makeup of the rooms - they have very large bathrooms with marble showers and a separate tub and shower." 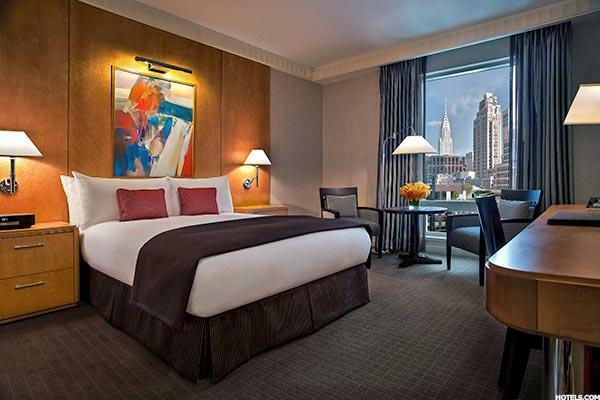 What's more, the rooms are quite large by New York City standards, with classic rooms starting at 350 square feet. 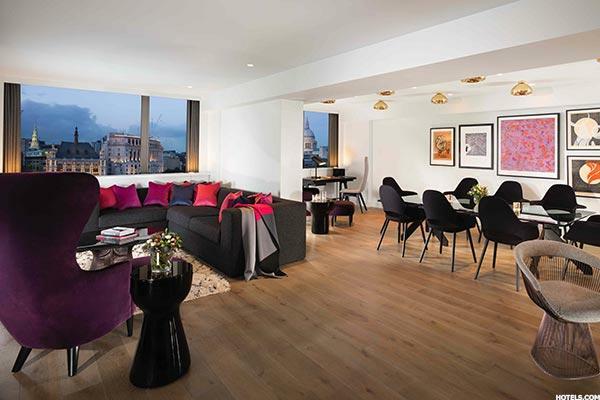 This four-and-a-half-star property is a prime example of the affordable luxury Belkin cites. When factoring in the outstanding strength of the U.S. dollar against the Thai baht, rooms here can be had for just $77 per night. 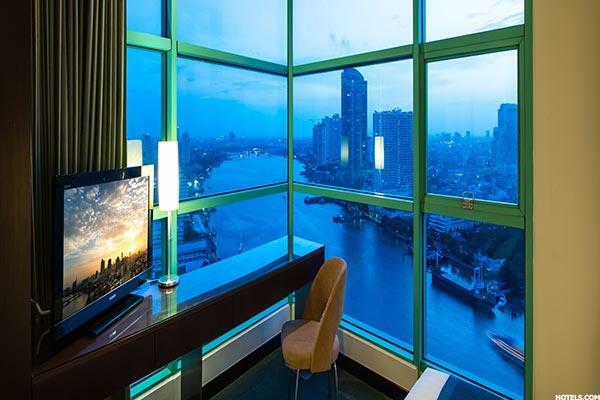 But what guests comment on most here is the breathtaking views of both the Chao Phraya River and the cityscape. Spa anyone? If you're a spa junkie, this hotel may just be the ideal vacation destination. 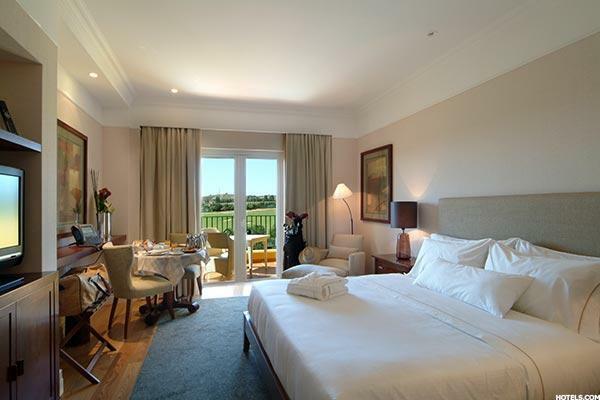 Hotels.com users rave about the enormous (more than 2,000-square-feet) spa at this property, which is surrounded by lush countryside overlooking vineyards. Don't you feel more relaxed just reading that sentence? Visitors also appreciate the free, and reliable, WI-FI here. Barflies will want to take note of this property and its award-wining SkyBar. 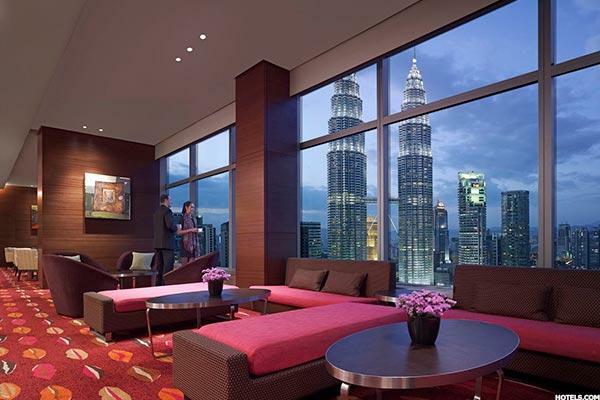 Located on the 33rd floor, and featuring amazing views of the Petronas Twin Towers from luxurious barside cabana booths, this swank watering hole receives raves from visitors. If vibe counts as a luxury detail, then that's a large part of what puts the Mondrian London on this list. "The overall vibe of the place is the number one cited thing," says Belkin. "It just feels like luxury when you walk in. Even the basic rooms are gorgeous, top quality all the way. 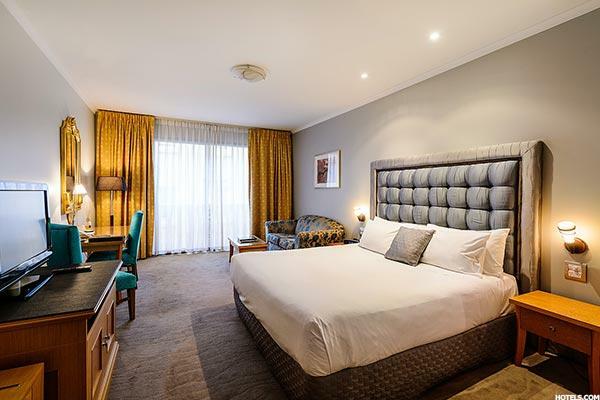 And the hotel is an interesting mix of an older historic hotel and a modern property." And thanks to Brexit, rooms at this luxury property now start at about $162 per night. If designer toiletries are enough to make you feel like an A-list celeb at a hotel, then perhaps consider Orlando's Waldorf Astoria for your next Disney visit. Guests rave about the Salvatore Ferragamo goodies in each room, including shower gel, body lotion, face masks, lip balm, hand and eye cream. But what's also notable here is that the property has only 500 rooms, making it nearly a boutique gem in the sea of enormous Disney properties. Room prices meanwhile, start at around $199 per night, which is a bargain in the luxury travel world. There's a Michelangelo masterpiece on the hotel ceiling, a pool with lavish cabanas and all the guest rooms are suites with sunken living rooms and opulent bathrooms. 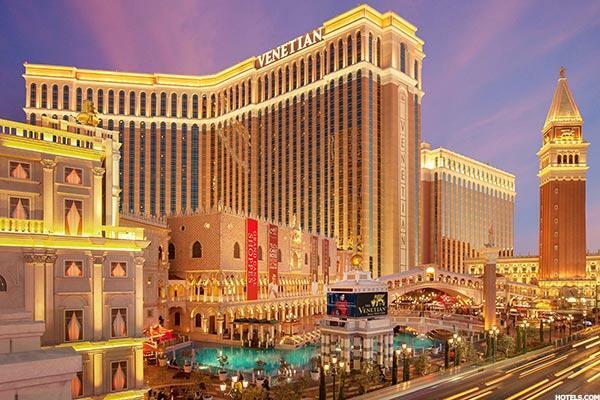 The Venetian may not be exclusive or overly expensive (rooms start at $159 per night) but it is certainly a crowd pleasure when it comes to making some guests feel luxuriously pampered.